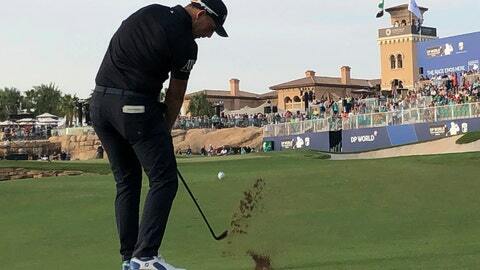 DUBAI, United Arab Emirates (AP) — Matt Wallace took his shots on time and took the lead at the World Tour Championship. The 28-year-old Englishman, who was fined 3,000 pounds ($3,800) for slow play in the first round, shot a 7-under 65 Friday for a one-stroke lead over Danny Willett (67), Jordan Smith (68) and Adrian Otaegui (68). Wallace was at 11-under 133 overall in the season-ending championship of the European Tour. Wallace, the most successful player on the European Tour this year with three titles, won six lower-tier Alps Tour titles in 2016 before moving onto the main tour early in 2017 by winning the Open de Portugal. This year, he has won the Hero Indian Open, the BMW International Open and Made in Denmark. Francesco Molinari (73) dropped outside the top 25 with three bogeys in his last six holes, giving Tommy Fleetwood a chance in the Race to Dubai for the European No. 1 title. Molinari was tied for 27th at 3 under, while Fleetwood (67) was at 8 under and tied for sixth. To successfully defend his Race to Dubai title, Fleetwood needs to win the tournament and hope Molinari finishes low enough. “Sometimes you just need to do a little bit of work,” Fleetwood said. “Felt like I hit it on range this morning with a decent understanding of what I needed to do, and a couple of good swing thoughts, and I was a lot more consistent today. Patrick Reed, playing alongside Rory McIlroy, shot a 66 and improved to fifth place at 9 under. McIlroy shot a 67 and was tied for sixth alongside Fleetwood, Kiradech Aphibarnrat (66) and Dean Burmester (65).